I love experimenting with new recipes when the mood strikes me ..sometimes I find them and sometimes I innovate.. The recipes which catch my fancy are the ones which can be made quickly, easily and of course.. last but not the least..have to be tasty.. So here’s one which I tried out very recently.. when I wanted to eat something akin to Stir fried veggies minus the oil..
Cut assorted veggies lengthwise in 2″ sizes. 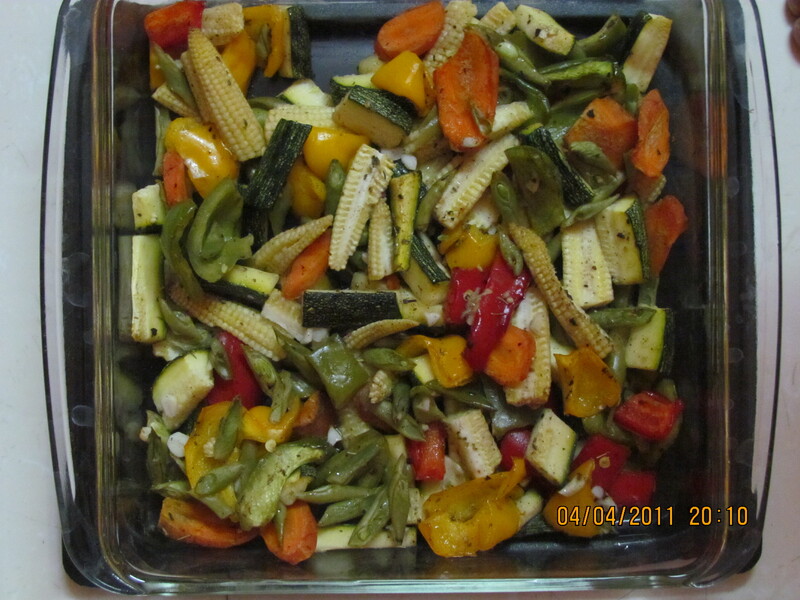 I used Baby Corn, Green / Yellow/ Red capsicum, Zuchchini, Carrots and Frech beans. Beans and carrots have to be cut thinner if you want them to cook along with the others.. Pound a few garlic cloves (I took 4-5) and add it to the veggies. Add pepper powder, Italian seasoning of (paprika, oregano, basil, thyme), salt , juice of half a lemon and 2-3 teaspoons of olive oil. Add the seasonings according to your taste but be on the lesser side…you can always add it in before eating if required. Mix it all up and place it in a baking tray. Bake for around 15 minutes at 250 Degrees. Dig in with your fork and enjoy ! Looks delicious! I use this exact same combination of veggies, sometimes add a bit of mushrooms/ shredded or chopped chicken fillet, and add penne pasta. And I add grated cheese in the end. I never knew how to use an oven except for cakes till 2 – 3 years ago. What type of oven do you have- I think I will buy too, after returning. @moonstone, I miss your podi, and want to return to India for it. I dropped a hint how much I like it and how I am unable to make it correctly, to a couple of colleagues here (whom I had invited for a sumptuous dinner, and would have gladly sent them more food/mithai boxes from time to time) – hoping they would give me a dabba of it- they didnt. sigh. Grated cheese wd definitely go with it.. thought of adding but extra carbs deterred me.. I inherited my mom’s 20 year old bajaj oven.. Indeed a good breakfast !! Thanks! Breakfast or snack or accompaniement..take your pick..